A new youth club aimed at providing 11 to 16-year olds in Hailsham with organised activities at the James West Community Centre on Monday evenings has received a generous funding boost from Hailsham Active. The Monday Club, which was launched by Hailsham Youth Service last autumn providing activities such as 5-a-side football, table tennis and badminton, has received £650 in vouchers from Hailsham Active, which will go towards the purchase of additional sports equipment for use at Monday Club sessions. Hailsham Youth Service (HYS) provides youth work, support services and opportunities for young people in the local area and is managed and funded by Hailsham Town Council. As well as running clubs and centres, HYS provides support services for young people, in addition to organising a range of recreational outings and activities, including those for the Friday Night Project. HYS will also be launching a Hailsham Youth Forum soon – representing the town’s young people and their interests. 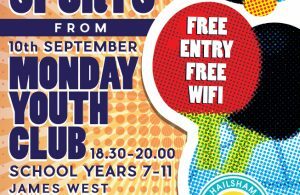 For information on the Monday Club and other youth services operated by the Town Council, call 01323 841702 or visit www.hailshamyouthservice.org.